UPDATE: The NPS arborists judged that 70 percent of the cherry blossoms reached their "florets visible" stage on April 1. On average, that occurs about 16-21 days before peak bloom. 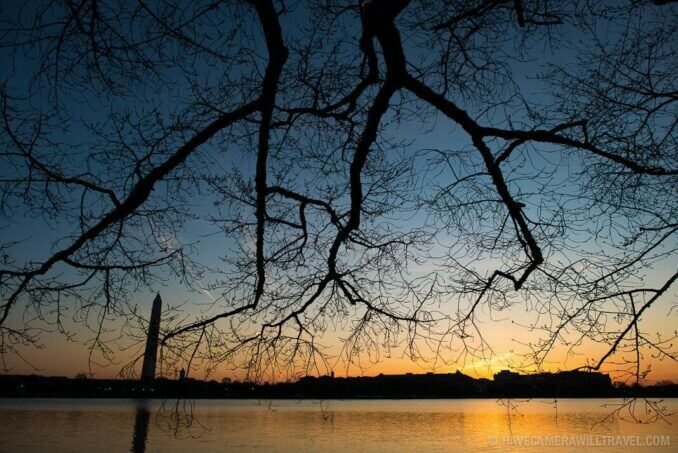 In 2014, it happened on March 23 and ended up being 18 days before a peak bloom of April 10. In 2013, it came on March 17 and ended up being 23 days before a peak bloom on April 9. It's a beautiful spring morning. There have been some definite signs of progress over the past few days, but still no flowers. The weather and temperatures more typical of spring that we've had this week have helped move things along. More daffodils are coming out around town, and the tulip magnolias near the George Mason Memorial (near the Tidal Basin) aren't out quite yet but look as though their first flowers are ready to come out in the next few days. On the cherry blossoms, we're starting to see some of the natural variations in timing from tree to tree, as you can see in the photos below. That's entirely normal as some trees inevitably start a little before others. There are also some photos of the indicator tree below. I walked the entire perimeter of the Tidal Basin this morning and didn't find any blossoms out, but there are few trees getting noticeably closer. The traffic restrictions haven't gone into effect on Ohio Drive yet. My guess is that'll change this weekend as visitor traffic grows over the Easter weekend, so it might be worth building that into your planning if you're coming down then. Sunday is the lighting of the cherry blossom lantern. You can find more details about it here. There's still work being done on the Reflecting Pool, and it's still drained. There haven't been any changes in the peak bloom forecasts so far, but the NPS arborists are of course watching the trees closely, and several of them were out and about early this morning. It wouldn't shock me if the forecasts get pushed back by a day or two, but no changes have been announced yet. If the peak bloom does come within the current forecast ranges, it's looking like it'll be towards the end of them. The current weather forecast for the week ahead looks quite nice but without any scorching temperatures that can speed things up rapidly. You can keep on top of the latest peak bloom forecasts here. And now that we're getting close, this page on what you might expect to see up to a week before peak bloom might be of interest. If you're coming in to town this weekend (April 4-5), unfortunately it looks like it's going to be too early for most of the cherry blossoms. It's still possible some early flowers might spring out, but if they do they'll be scattered and you'll have to go hunting for them. If you have a choice of Saturday or Sunday down at the Tidal Basin, Sunday is probably a better bet simply because the extra day will give just that little bit of extra time. The weather forecast is also better for Sunday (and it'll probably also be more crowded). This tree, which has become known as the indicator tree, reliably blooms a week to ten days ahead of the others. Here's how it's looking as of this morning. I've also posted a detailed guide on how to find it. These are over by the George Mason Memorial and typically come out a bit ahead of the cherry blossoms. They're not flowering yet, but it's looking like they might start to open over the next few days. There's a small group of fruit trees (perhaps plums) blossoming near the World War One Memorial. You can find information on how to find them here. Thank you for the wonderful pictures. We had planned on seeing them in person, but it didn't work out. We are seeing some great trees here in St. Louis. It's a great spring everywhere. David, thanks awfully for your follow-up on my suggestion to include status photos of the indicator tree. Also very much appreciated your new page with the detailed info on how to locate this tree. Brilliant! Well done you! You're welcome, and thanks for the original suggestion! Thanks David for all the helpful information. Will you be posting any updates today? I've just post a new one from this morning. Although NPS didn't move the peak bloom date, the predictions are now for the next weekend, around March 18-20 because of the "visible florets" of the cherries? Not necessarily. There's been quite a bit of progress the past few days. I'll posting a new update in a few minutes with new photos from this morning. Thank you for providing this wonderful service to DC residents and visitors. You were spot on last year and I'm looking forward to going down there. Evening can be pretty crazy, so if you're trying to catch some good shots without hundreds of people, I found that 7 or 8 AM was a good time during the week. We will be there 4/17–19. 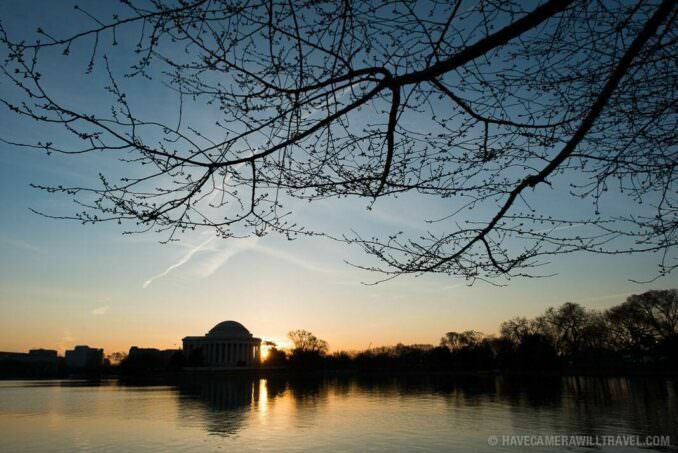 What is the best time of day to arrive at the Tidal Basin? It looks like that might be right around the peak day. My favorite time of day down there is just after sunrise--especially if it's a clear day. But there's not really a bad time to be there. As with most attractions, it does tend to get busier as the day goes on--and parking will get harder--especially after the tour buses start rolling in mid-morning. It's open 24 hours, so there are no queues, tickets, or gates to contend with. We'll be there in about a week. From your experience of how things progress, what do you think it will be like late next week (8th-9th)? Thanks in advance, love your site! There'll probably be some flowers to see but most of the trees likely won't be in full bloom. Assuming, for argument's sake, that peak bloom comes on April 14, this photo timeline will give you an idea of what you might expect up to about a week before peak bloom. Thank you so much for all details, your website is simply the best! I added yours on my favorite tool bar, I've never learned so much about these blossoms in my life! Did you have a chance to drive by the Reflecting Pool, is it filled? Glad it's useful! And yes, I did get to the Reflecting Pool but unfortunately it's not doing a lot of reflecting just yet--as of this morning it's still drained and they're still doing some kind of work on it.